Hey there everyone! Yes, I'm back and late again, as usual. So, this happened last Friday, but I'm gonna go ahead and talk about it now. Hope you don't mind. Well, on Friday, my host father got him and myself some special tickets to a Tokyo Giants baseball game, complete with Lounge seats, all you can eat buffet and even a chance to see the teams practice before the game. Before I start detailing the entirety of the day, let me give you a little background on the team. Tokyo, much like New York, has not one baseball team, but two (perhaps because of the city's sheer size and population, I really don't know). The teams are: The Tokyo/Yomiuri Giants, and the Yakult Swallows. Yomiuri (the famous newspaper company, and Yakult are simply the names of the corporations that sponsor the teams. So, the home stadium of the Yakult Sparrows (who happen to be my host father's favorite team) is in an (evidentally) small outdoor stadium called Jingu stadium, whereas the beloved Giants are housed in the massive, towering Tokyo Dome complex. 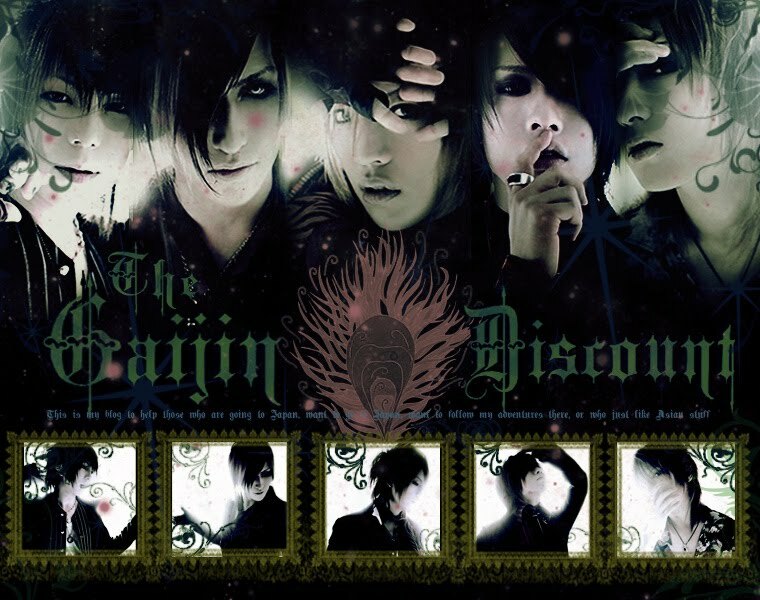 A word about Tokyo Dome itself. Tokyo Dome is more a sprawling complex (in the same way that Disneyland is a complex), containing several buildings, amusement parks, roller coasters that come out of buildings to loop over highways, multiple stadiums/concert halls, malls, arcades, restaurants, etc. It's sort of like a gargantuan amusement park, as it were. Whereas most teams in Japan (there are only a few) have real animals for mascots (Osaka Tigers, Hiroshima Carp [who we were playing on said day], etc), the Giants have an almost, sorta real animal for a mascot. The Giant's colors are black and orange, and their logo is a Y (for Yomiuri) interlaced with a G (for Giants), and thus, taking this logo, the team made their mascot a rabbit sort of creature whos face resembles the logo. They affectionately call this creature the Jabbit (Giants+Rabbit). Despite it being a rather crappy, rainy, soggy sort of chilled day, the Tokyo Dome complex was filled with people, most of whom were either there for the game, or there to try to get tickets for the game. At around 3 o'clock, my host father and I took our special (and I'm sure, quite expensive, tickets) down to a garage-like area, illuminated by yellowed, flourescent lights, the sort of place you expect bit 18-wheelers to back into to deposit cases of softdrinks for vending machines, and boxes of junk food for vendors. We were given a laminated badge that read 'Guest' and told to wait in line, which in fact lasted a good 30 min. or so, before being led through another line where haphazard cops looked through your bags to assure you had nothing suspicious. In groups of 20, we were let into a small, windowed room, and shut in. It was the sort of eerie 1984 thing that was reminiscent of a scene that might be from Battle Royale, caged into a glass space with cops on either sides holding the doors shut, and holding you in. I have yet to figure out the necessity for this. We waited a minute or two, then the doors swung open and a preppy 20 year old girl, decked out in orange legwarmers, a short orange skirt and an orange and black visor, held aloft a flag that read 'Giants,' and proceeded in front of us, leading the way past stands getting ready to sell team goods, bento boxes, cones of popcorn, etc. We were led into the stadium, into Tokyo Dome itself and one couldn't help but peer up at the lofty ceiling, who knows how high, and marvel at the sheer size of the place. I suppose it's about the size of any of our American baseball stadiums, but having now lived in Japan for 8 months, I can't remember ever having been in a place so large and open. We proceeded down to a space literally ON the astroturf, where about 40 special seats sat waiting behind tall nets. On the seats were towels sporting the McDonald's logo, a baseball glove, and a baseball helmet. I later learned that these are the McDonalds' priority seat, and because of their location (and because the nets protecting them are taken down for the game), it is mandatory for all spectators there to wear the helmets so as not to have their head bashed in by a stray ball. Anywho, we were led into the space and allowed to watch the Giants team in practice. As one might expect, there were people doing stretches, some batting, some catching, etc. Around the stadium, up in the stands, police officers, like packs of keen bloodhounds, meandered their way through the seats, checking, I would assume, for suspicious packages. Much later, when ticket-holders were let in, before the game, the cops remained, but instead of watching for suspicious activity, their jobs changed to that of whistle-blower. That is, whenever a ball was hit and wasn't going to land in the field, but rather in the stands, that section's policeman would blow his whistle, and everyone would move out of the way. While watching the practice, the Jabbit mascot came out to take pictures with our group (there were only about 50 of us in all), and then we all got together and posed for a free picture (free only if you overlook the high price of the ticket). After that, we were shown back out, given a gift (a fold-out box sort of thing), and proceeded up to look at the various gift shops around the place until 4, when they started letting people in before the game. Our special tickets were on the same balcony as the box seats, and in contrast to the uncomfortable, cramped plastic benches en masse below, our seats were comfortable, cushioned, only 5 to a row, and had a fold out table. As time for the game to start loomed nearer, the girls hawking various goods, began to meander through the rows below. While the 'lobby' areas certainly sell food, most spectators never get out of their seats to purchase their food/beverages. Instead, girls in various neon colored skirts and caps walk to the very front of the row, bow to no one in particular and raise their hand, proceeding slowly up the steps and stopping if anyone in the crowd mirrors their raised hand. Of course the girls sell soda and tea, and bento boxes and popcorn, but there were also girls walking around with huge carafes of coffee, and those selling beer, were the most interesting of all. They had on huge, covered backpacks which were, in fact, kegs of beer, and from their belts dangled a thing holding tankards. Whenever someone flagged them down for a tank of beer, they would pull out a spicket/tube and fill a tankard full, just like beer on tap. These girls, however, were not prowling through our section. Instead, we had a catered buffet with corndogs, salad of all sorts, fried shrimp, pasta and flan and green tea cake for dessert. As for the game itself... The experience was a little different from an American baseball game (at least I think). You see, I was still knee-high to a grasshopper when I last went to an American baseball game, so I can't very truthfully boast full knowledge of the US experience, but I'll tell you what I can of baseball games here. First of all, the fans are amazing. Of all things interesting in Japan, by far, fandom is the most unique and interesting, whether it be for singers, actors or sports. 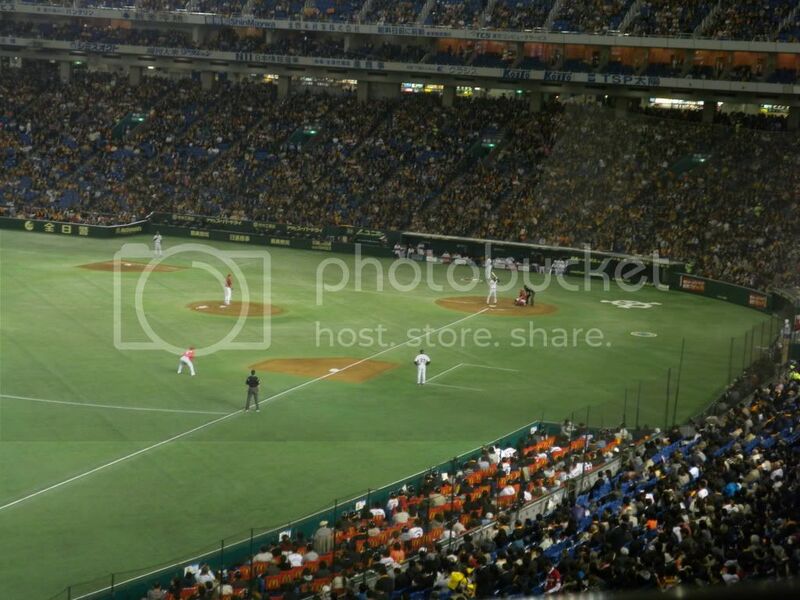 The opposing team was the Hiroshima Carp, and they had there own section of the stadium, a distinguishable red and white from the almost entirely orange and black sea of people. Now, I must mention that each player on a team has a song, or rather, a specific chant. My host father went on to tell me that in fact the songs are put on a CD (whether fan made/distributed or actually buyable in stores, I don't know), and all fans get the CD and memorize the words and music. Thus, whenever a player comes up to bat, everyone in the stands for that team beats their clackers (large inflatable sticks) to the tune and sings/chants that player's particular song. And, in fact, students (high school or otherwise) bring in their band instruments: trumpets, saxaphones, etc., and play the melodies. There was a fan-made band there for each team. Also, there were massive flgs, large enough to cover 3 or 4 rows of seats, which one man was self-appointed to wave all throughout the team's inning. 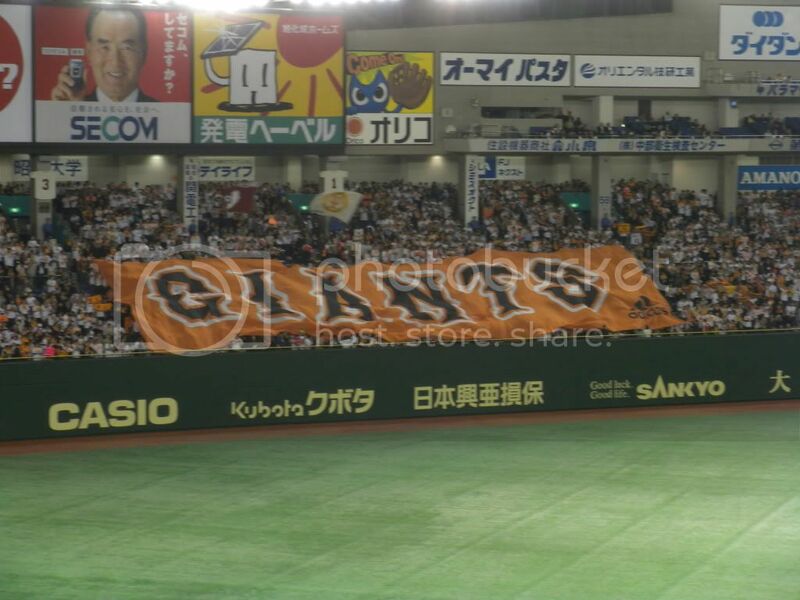 For the Giants, naturally their flag said, "Giants," but for Hiroshima, there were two. One was "Hiroshima Carp," but the other was in red and white and said "Tokyo." When I asked about this peculiarity, my host father said that it was meant to represent the native Hiroshima people who now lived and worked in Tokyo, and thus were indebted to Tokyo, but still wanted to show homeland pride. So, a man would come up to bat and, strangely enough, almost always, the pitcher of the opposing team would wait for the player's song to finish in the stands before actually pitching the ball. If, by stroke of luck, a player hit a home run (which caused us to get a free Big Mac), or if he scored a point, everyone in the stadium would lift their orange towels and wave them around, singing yet another victory song. In contrast to American sportsmanship, even the supporters of the opposing team would give applause with gusto. So, that's the basics of what I've learned about Japanese baseball games. And they go by faster, though I think that makes them more interesting, because they cut out all the boring waiting/faking out that runs rampant in some baseball games. We left in a downpour after the 7th inning, as Tokyo Dome is none too close to our apartment, my host dad didn't really care who won (the Giants did), and we didn't want to have to squeeze into a packed train (though it was still packed, regardless). On a side note, the Giants had a very famous, beloved player who, ironically shared the same name as the famous actor, Kimura Takuya. About two or three weeks ago, during practice, he collapsed with what I gather was a brain anurism (dunno how to spell it), and was rushed to the hospital. Unfortunately, a few days later, he died. He was, to all Japanese sports fan a legend and much loved, and so everyone was very sad at his premature passing (he was in his 50s I think). The day after the game we went to, there was another game and a fan memorial service, where thousands upon thousands of people poured into Tokyo Dome, coming to burn incense and pray, or bringing flowers and paying condolences. His son threw out the first pitch. So that's all for now folks. Sorry it's taken so long. In other news, I made Takoyaki (octopus balls) or, in my case Ebi Ebi Yaki (shrimp balls) with my host brother and his girlfriend the other night and while, difficult, it was a blast and I think I'll have to buy a takoyaki pan before I come home. Well, now that my host dad sees he's found a baseball buddy, he's planning on taking me to see the Yakult Swallows at Jingu stadium... maybe Friday. Not really sure. I'll post again whenever I can. Now that school's started back up, I'm a bit busy, and true to form, almost every frickin day the monkeys that run the place come up with new problems for me to have to figure out myself (currently telling me to pay them $500 by tomorrow when I've only got $300 on me). Sigh. Oh, and I've added a tracker at the bottom here. I got a few comments from people who aren't my friends/family and realized maybe other people actually read this stuff, so, out of curiosity, I put that at the bottom of the page. Btw, if anyone has any questions for me or wants me to write about something in particular, comment and I'll see what I can do. Well, til next time!